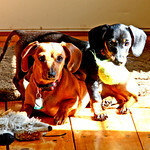 I am enjoying life with my fantastic hubby on our farm with our animals, including a couple of adorable doxie's! I have many hobbies, including Digital Scrapbooking, photography, and the old time housewifely duties of churning butter, making cheese with our raw jersey milk, making soap & personal care products so I know what is in some of the products we use. I live on a farm in north central Missouri, with my DH, our two furry babies (doxie's), some chickens, cows, LGD (livestock guard dogs) & cats. (hopefully eventually we can get goats again...as they are my first love! LOL) I really enjoy the quiet country life, its so peaceful, and has a quiet beauty. I enjoy taking pictures around our farm and messing with them on the computer, which led me to Digital Scrapbooking in 2005. With all the things I have going on in my life here on the farm, I don't have time to do as much of it as I'd like to. P.S. If you would like to know a little more about Digital Scrapbooking, Journaling or to find a few tutorials to help you get started, you can visit a page I set up to explain it a little more here. Don Underwood mentioned getting to visit with you guys at our home fellowship Sunday, and I said, "Hey! I've heard that name before!" You should come meet with us sometime!